Simon K. Boberg | Team | BLAM! Simon K. Boberg (born 1969) is a self-taught theatre director, playwright, translator and dramaturge. For the last 16 years he has worked freelance in a wide range of theatres in Denmark and alongside this, he is artistic director and manager at Husets Teater, Copenhagen. Together with actor Mads Wille and director Jens August Wille he created the independent theatre PLAN-B in 2002. Despite of the relatively short period of existence, PLAN-B became one of the most important stages for new Danish and international stage art, presenting world premieres of playwrights such as Sergi Belbel and Dejan Dukovski as well as both music and animation theatre. In 2008 Boberg and Mads Wille took over Husets Teater where they have developed the artistic profile and maintained the position, as a theatre with a relevant, contemporary and artistically ambitious repertoire. 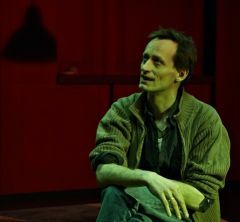 As a director Boberg had his debut with the play “Powderkeg” by Dejan Dukovski at Mammutteatret in 2002. Since then he has directed 14 plays in Denmark, both in his own theatres (Husets Teater and PLAN-B) and as a free lance director in other houses (The Royal Theatre, Aarhus Theatre, Mungo Park, GROB etc). Boberg is interestedHis latest show, “Peggy Picket sees the face of God” by Roland Schimmelpfennig was co-produced by Husets Teater and Teater Svalegangen, and played for several months (january – april, 2013) all over Denmark. Boberg is very dedicated to developing new playwriting, and he has made staged readings of contemporary playwrights in both Denmark, Iceland, Italy and France. As a playwright he has written 7 plays and alongside this he has worked as a production dramaturge and translator at a wide range of danish theatres. As a teacher and consultant he works regularly at the Danish School for Stagearts and at the Playwrights School at Aarhus Theatre.